A man on a stolen mobility scooter stopped by police in a scene "like something out of Little Britain" has been sentenced to carry out unpaid work. 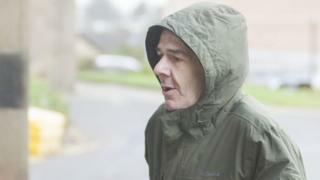 Andrew McConnachie, 47, set off at 5mph from Inverkeilor, near Arbroath, while twice the legal alcohol limit. McConnachie, of Aberdeen, stole the vehicle after he was ejected from a bus. His solicitor compared the incident to the popular BBC comedy show. Depute fiscal John Adams told Forfar Sheriff Court that McConnachie had been thrown off the bus at about 21:30 for being sick. He said: "The driver was coming back in the same direction when he saw the accused driving a mobility scooter which the accused did not have with him on the bus. "The bus driver was concerned because he was all over the road." Police stopped McConnachie, who said the scooter was his, but passers-by told officers it belonged to a local man. Mr Adams said: "The accused then explained that he saw the scooter and assumed it was for hire." McConnachie admitted stealing the scooter from Main Road, Inverkeilor, in December 2015 and driving with excess alcohol. Defence solicitor Nick Markowski said McConnachie being pursued by a police vehicle with its blue lights flashing, while weaving around the road at just a few miles-per-hour, would have been like a sketch from popular comedy show Little Britain. The solicitor said: "He is on a range of medications and medical advice not to drink was not advice that he followed." "The scooter was just beside the bus stop, he got on it and luckily for him he didn't go onto the main A92, which would have been extremely dangerous." Sheriff Pino di Emidio ordered McConnachie to complete 70 hours of unpaid work and banned him from driving for three years.